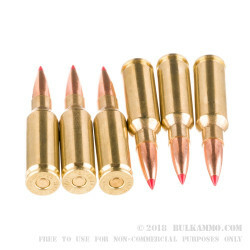 Hornady has a great reputation for producing some of the most effective factory-loaded rounds in the business. 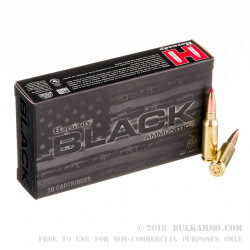 This 200-round bulk case features match-grade 6.5mm Grendel cartridges crafted to give you an advantage over the competition. Hornady takes great care to load each Boxer-primed brass case with the right combination of premium powders and primers so you get predictable ignition and consistent velocities. 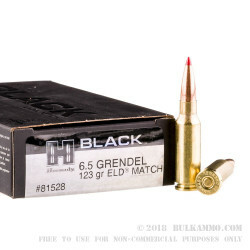 The muzzle velocity of this 6.5mm Grendel is 2580 fps when fired from a 24" barrel. The 123gr ELD (Extremely Low Drag) bullet is designed to shirk wind drift so you can have the tightest groupings on the range. The ELD has a Heat Shield tip that helps it resist deformation in flight when its velocity causes the bullet temp to rise. Hornady doesn't mess around with the quality of their match ammo because they know serious shooters demand impeccable performance. 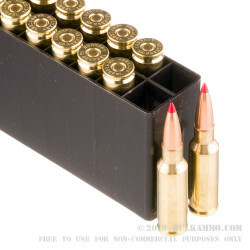 Order your 200-round case of this 6.5mm Grendel and see for yourself!